Mid: Brooke casually took up running in May 2016, running local 5k and 10k’s. By October, she’d hit a 5k PR of 19:11. Distance: After nine months of running, Brooke completed her first full marathon in February 2017—earning her a BQ. In September 2017, she took 2nd OA in the Omaha Marathon and brought her PR down to a 3:18. 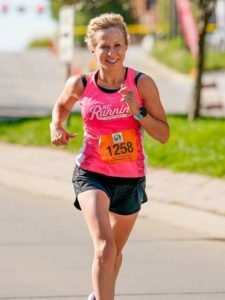 She placed 3rd OA in her first two half marathons: the 2017 Topeka to Auburn Half Marathon; and the 2017 San Fran First Half Marathon. Brooke is an ultra-runner that loves to race on road and technical trail. Track: Brooke was the only Sprint Employee to run all individual and relay events for the 2017 Kansas City Corporate Challenge—her first track meet. She hit her goal of a sub-6 mile.